Here is another fun popcorn recipe. J-E-L-L-O popcorn! 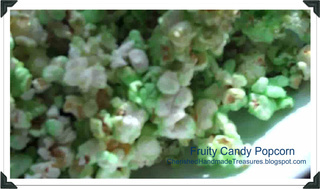 This popcorn tastes fruity and delicious, and again, it makes a fun gift and/or just a yummy treat. Because if you're making this as a gift who could resist making more for them as a treat? The great part about this popcorn is you can use ANY flavor of Jello. So this recipe can be customized to your tastes or at least your taste of the moment! 1. Preheat oven to 300°F. Line a jelly roll pan with parchment. You can also use foil, but spray lightly with non-stick spray and set aside. Place popcorn in an extra large mixing bowl. 2. Place butter and syrup in a saucepan on medium heat. Stir until butter is melted. Add sugar and Jello and stir to combine. 3. Increase heat and bring to a boil. Then reduce heat and simmer for five minutes. After it has simmered for five minutes, immediately pour over popcorn in bowl. Be careful, it’s super hot!! 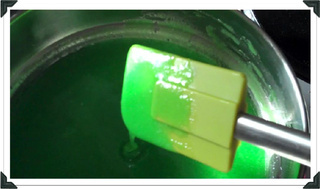 Mix right away and keep stirring so everything gets well coated. Spread mixture onto prepared pan and spread out evenly. 4. Pop in the oven and bake for about 10 minutes. 5. Remove the pan from the oven and let cool to room temperature. Then break into pieces and enjoy! You can certainly eat this unbaked as well and it’s just soft and gooey instead of light and crunchy. You should definitely bake it if you’re going to pack it up for gift giving, or serve it as party food. Yum, I need to get some cherry jello. I just discovered your blog. It is so cute. I subscribed to your posts, and I am looking forward to it. When I get some time I would like to go through the archives. I know that there will be many things I want to do.